Characters From Director Beth Hughes-Brown: As those of you who have been cast in shows I’ve directed in the past are aware, I’m flexible in that I don’t necessarily cast “by the book,” i.e., use the ages (and sometimes sexes) suggested by the playwright. For general guidance, here are Mr. Hollinger’s words (mostly). Maggie Pelletier: (Script says mid-30’s) Sharp, attractive lady cop. Always gets her man. In love with Frank, but not quite ready to marry him—she has a case to close first. Frank Keller: (Script says mid-30’s) [Also plays Priest.] G-man. Lynn McCarthy: (Script says early-20’s) [Also plays Clerk.] Daughter of Senator Joe McCarthy. Naïve, but learning fast. James Appel: (Script says early-20’s) [Also plays Woody, the crime photographer; and Harry, a Georgia-accented coroner] He’s wooing Lynn, but he’s also a nice young Russian spy. Mrs. Kravitz: (Script says late 40’s/early-50’s) [Also plays Mrs. McCarthy and Mrs. Van Nostrand, the bridal shop clerk] Landlady and secret lover of Andrei. Andrei Borchevsky: (Script says late 40’s/early-50’s) [Also plays Petey, the second G-man who works with Frank; and Herbert, the Casper Milktoast husband of the bridal shop clerk] A slickered middle-aged fisherman—or is he? Super 1, Super 2, Super 3—The three Supers are required to be masters of physical comedy. They may play the Announcers, the Bartender, Dr. Kasden, Major Hartwell, and/or sing jingles. They will also change sets and occasionally serve as props. AUDITION PROCESS: Auditions will consist of readings from the script – The director encourages but does not require a 1 to 3 minute comedic monologue. Or you can tell a joke. Or do something else that’s funny. This normally works to your advantage, as it will give you an opportunity to make us laugh. AUDITION FORM: Resumes and head shots will be accepted, but are not required. 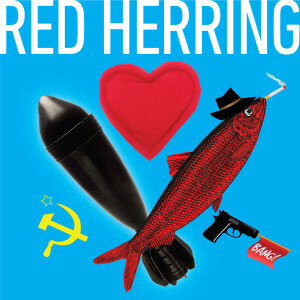 Please Click on this link and ALSO COMPLETE the attached PPF Red Herring Audition Form and bring it with you to the audition. Please come to auditions prepared to list any availability conflicts over this time period. Space is provided on the audition form for this purpose.